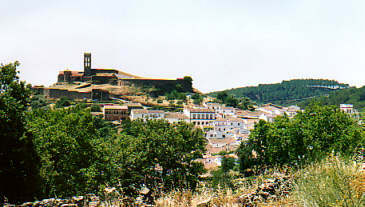 Almonaster la Real is a village in the Sierra de Aracena. It has a church, a city-hall, a castle, a mosque, a plaza de toros and a roman bridge. So, it is a typical village for this area. Or, perhaps not, because it is the only town in the area with all these 6 items. All the others towns in the area only have 4 or 5. There must be a lot of money in Almonaster. Mirjam is walking along a small river. Although you can't see the river, you can recognize it by the pink flowers of oleander: each river is visible as a pink ribbon in the landscape. 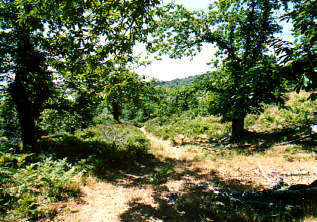 The trees you see here are Spanish chestnuts. A lot of local recipes contain those. 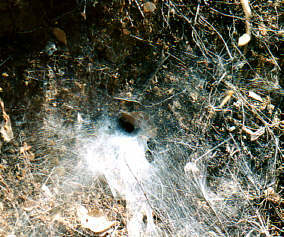 This spider made a trap-hole of his web. That's what you call a web-based application. 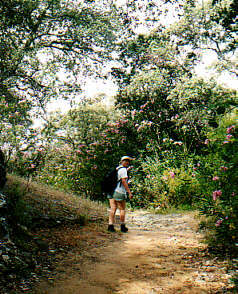 We made several walks in the Sierra de Aracena. 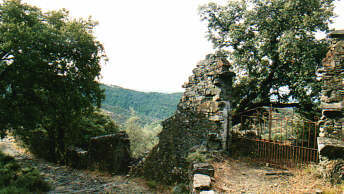 The area is ideal for walking: there are several marked trails, it isn't extremely hot, there is a lot of shadow, and after a few kilometers you always find a bar where you can stop for a cold drink. 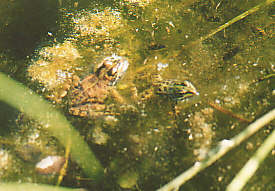 A green frog and a brown frog together in a pool, the remains of a stream. 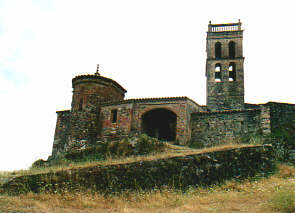 Another village is Linares de la Sierra. The local attraction here is that you have to walk through the plaza de toros (the bull fighting arena) to get to the bar. 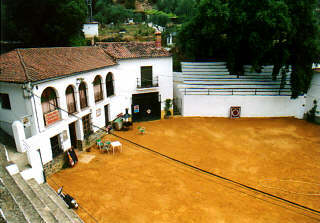 When we were here, the arena was filled with sand, for the bullfight the next Sunday. Normally, the arena is used as a parking lot for the town's cars. This building is the mosque on the left hand, with the castle built onto it on the right hand side. The picture on the right shows the mosque from inside. 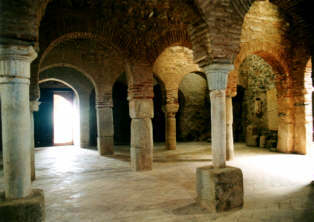 Although it is very simple, it reminds of the mosque of Córdoba, the Mezquita. It was probably a popular model for a mosque in those days (and this time). Several years ago, Leon saw a completely different type of mosque in Iran, without these typical pillars and arches.